Peek through this Classic Tin Kaleidoscope for a beautiful display of colors and patterns. 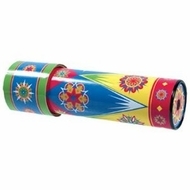 Simply rotate the end and watch the explosions of color inside the tube change as you twist it. Makes a great gift.